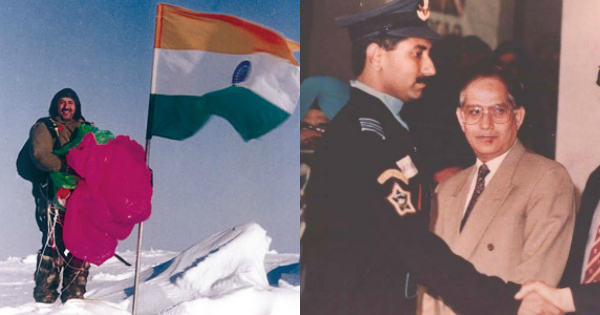 Wing Commander Sanjay Thapar VM is the man of many firsts in the field of parachuting, two of his achievements are acknowledged as world records and seven others as National Records. He was the first Indian to introduce tandem skydiving in the Air Force. As befits a skydiver, Sanjay is quite an adventurous fellow. He served in the Indian Air Force and has been skydiving for almost 30 years. Now in his sprightly 50s (he first jumped when in his early 20s), he’s lost none of his sense of adventure: Sanjay still does around 100 jumps every year! Widely traveled, he has also pursued mountaineering, paragliding, powered parachuting, hot air ballooning, skiing and water skiing! He served in the Indian Air Force and has been skydiving for almost 30 years. Now in his sprightly 50s (he first jumped when in his early 20s), he’s lost none of his sense of adventure: Sanjay still does around 100 jumps every year! Widely traveled, he has also pursued mountaineering, paragliding, powered parachuting, hot air ballooning, skiing and water skiing! "I have been a national champion, and hold a few world records besides, including attempting 46 jumps in the space of three hours, and jumping with the largest Tricolour on the eve of India’s 50th anniversary of Independence, in 1997. In addition, I have over 5000 parachute jumps to my credit in India, the highest number attempted in the country. I have also competed abroad, and led all three Indian skydiving teams that have toured. With so much experience under my belt, I’ve certainly had many memorable moments as a skydiver – both in terms of excitement and emergencies! In 1996, I attempted a jump at the North Pole, and in 1991, I led the Indian team that took part in the 6th World Cup, in Jakarta, Indonesia; we had to jump out of a Hercules aircraft to a small island – dominated by forest – in the middle of the sea ."